In this paper, we described a technique to extend the static notion of iStar goal models to enable modelers to understand how their model might evolve over time. A. M. Grubb and M. Chechik. Looking into the Crystal Ball: Requirements Evolution over Time. 2016 IEEE 24th International Requirements Engineering Conference (RE), 2016. © IEEE 2016. This page discusses supplemental material. It is recommended that you read the paper prior to continuing here. We extend the meta-model from the iStar 2.0 Language Guide because it is the most recently publish iStar meta-model. The image below shows our extension to the iStar meta-model in red. Each Intentional Element (called Intentions in the paper) is mapped to a Dynamic Function. A full list of dynamic functions is available in the paper. Each Intentional Element is also mapped to a set of Qualitative Evaluations: one evaluation for each time step. We introduced the problem of a City trying to decide what waste management solutions to choose. 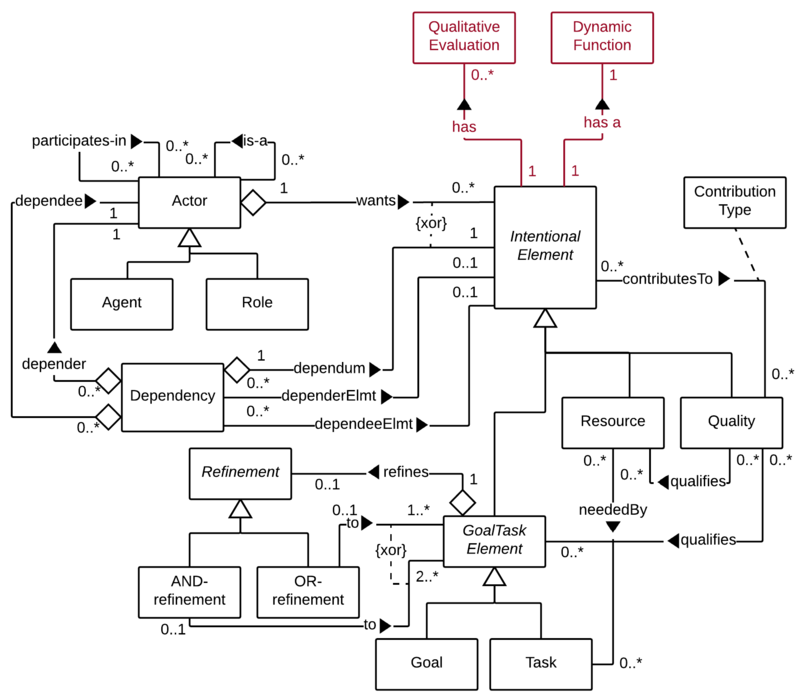 The figure below shows a goal model for the Waster Management Example (WME). When we translate the model in to CSP, we first take all the elements in the model and encode them as a series of IntVars in the solver Store. Each file has been annotated using Java style comments. If you have any questions or think we can further clarify some part of this email amgrubb at cs dot utoronto dot ca.